What most of us glance at fleetingly, artist Heather Hartman examines intimately. The natural world’s minutiae—a fogged-up pane of glass or sunlight woven through tree branches—is rendered through layers of paint on her polyester mesh canvases. Hartman does focus on such ephemera, parlaying it into artworks that remind one of “bokeh,” the aesthetic quality of a photograph that contains out-of-focus points of light. 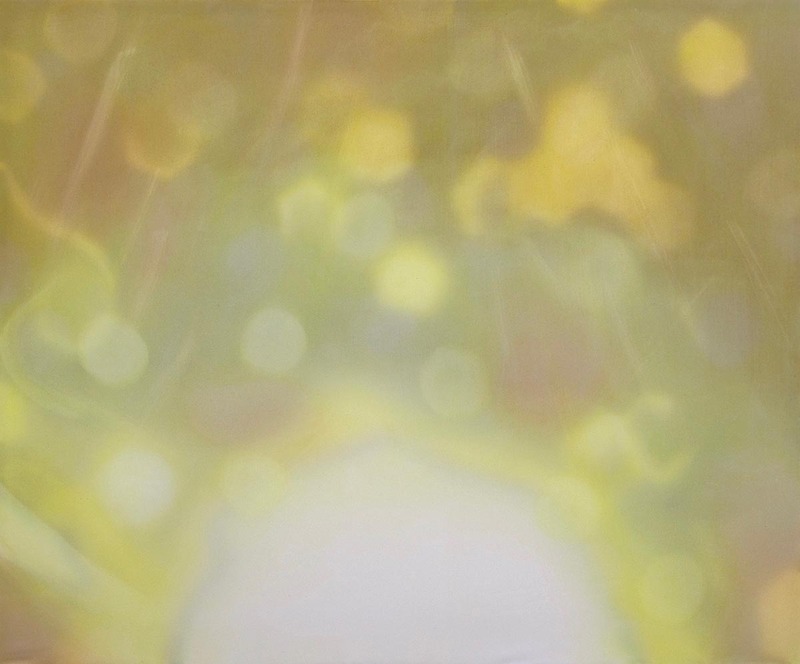 Her paintings—produced in a mélange of oil, acrylic, and gouache paint on paper—possess bokeh’s ethereal quality. Accentuating the appearance of diffused light, Hartman finishes each painting by obliterating marks with a large brush. This month, Hartman joins her studio mate, Eleanor Aldrich, in an exhibition of their paintings entitled Shadyville. The show opens on September 2 at the Channel to Channel art gallery in Nashville’s Wedgewood-Houston neighborhood. It closes on October 26. In its earliest incarnations, art was representational. In modern abstract art, however, a fluidity of representation makes reality teeter like a top. Abstract art is never precise in its depiction of forms. True to that philosophy, both Hartman and Aldrich infuse otherwise-realistic subjects with an abstract aesthetic. In Aldrich’s portraits, the faces are obscured. And one would never guess that Hartman is painting minute objects we overlook every day. 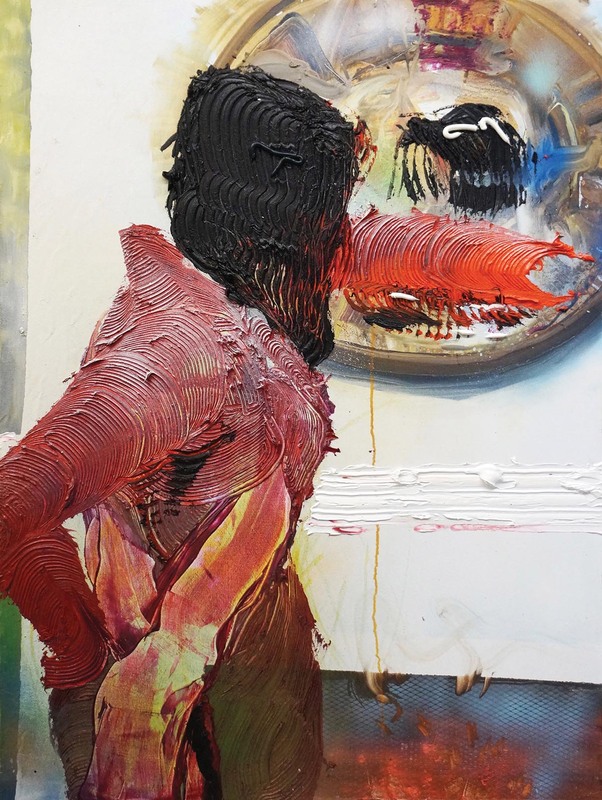 “I have done a lot of portraiture and figurative painting in the past,” Aldrich says. “Faces have become less interesting to me. I’m really allergic to preciousness. “To make a face, it’s problematic in that it has to be quickly painted and generalized, so it feels generic and unspecific,” she adds. “Or if it’s based on a person, it brings that person’s individuality to the painting, which I’m not particularly interested in.” Aldrich creates her mysterious subjects’ bodies by building up thick oil paint and covering it in cross-contour marks. The two artists met at a Knoxville-based space for artists’ collaboration called the Vacuum Shop Studios. It soon became clear that they were philosophically intertwined. 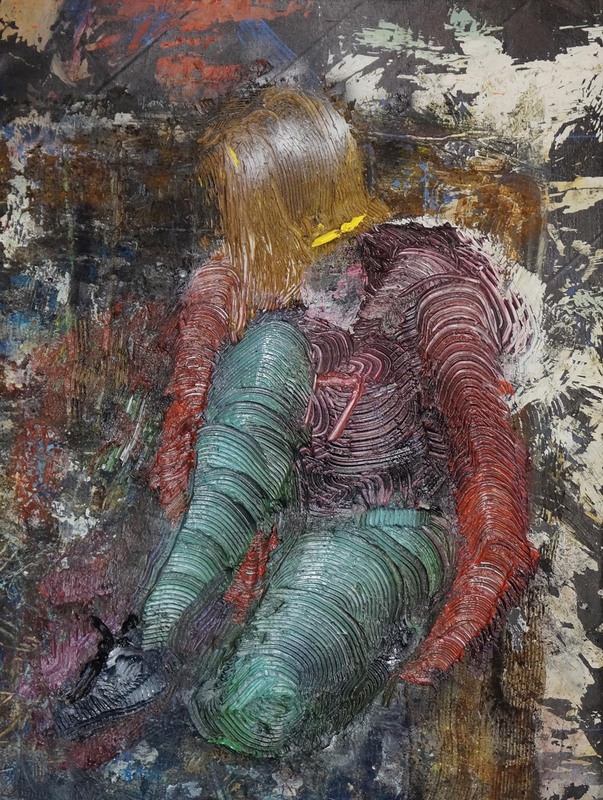 A frequent topic they discuss is their fascination with material transformation, whether those materials are Aldrich’s silicone and construction caulk or Hartman’s polyester mesh used as a canvas. There is perhaps no better summation of this idea than the word Shadyville. The work of these two artists certainly marks the spot where shadows become somehow illuminating. See Shadyville by Eleanor Aldrich and Heather Hartman at Channel to Channel from September 2 through October 26. For more information, visit www.channeltochannel.com. See more of Aldrich’s and Hartman’s work at www.eleanoraldrich.com and www.heatherhartmanart.com.